The thermal balance is the mathematical determination of heat input and output, i.e. the comparison of heat flows within a system. With respect to the casting process, the thermal balance is mainly determined for permanent molds. Here, the pure heat input is understood to mean the heat requirements. In pressure die casting, the liquid melt is introduced into the die casting mold at high speeds (see Flow rate in pressure die casting). The tool’s task is to accurately reproduce the contour and initiate solidification through heat extraction. The crystallization heat (latent heat, solidification heat) released during solidification is dissipated into the die casting mold and the die-cast part is cooled in the mold until demolding (ejection) is possible without problems and low subsequent distortion. This requires the temperature to be distributed in the casting as evenly as possible upon ejection which is highly dependent on the temperature distribution in the tool. Therefore, the mold needs to absorb and emit a significant amount of heat to ensure that the melt solidifies and cools as desired. Within one cycle, precisely the amount of heat introduced into the tool (mold) by the melt, solidification and cooling of the casting until demolding should be released to the die casting mold. The die casting tool dissipates this heat to the environment by radiation, convection and thermal conductance. If the heat level increases, a certain amount of heat must also be dissipated via the die casting mold – away from the mold – to the heat transfer medium (heat transfer oil or water) circulating in it. If the system is not equipped with cooling water distributors, this heat can only be dissipated inside the heating and cooling units by cooling. Therefore, the purposes of these units are heating and cooling (die heating and cooling) and ensuring an even thermal balance (Fig. 1). 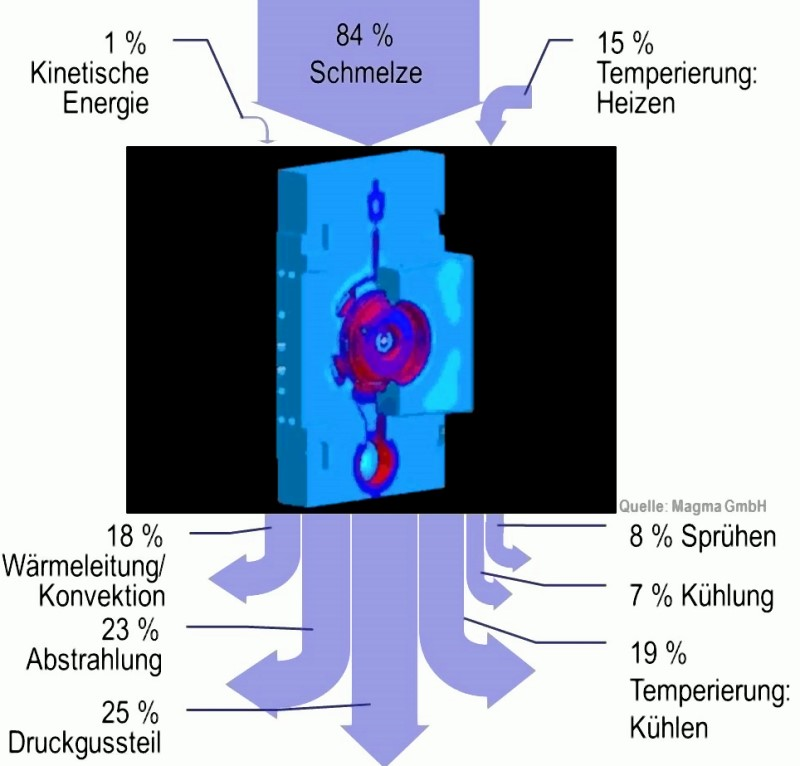 The basic means of heat input and output in a die casting tool are illustrated in Fig. 2. The thermal balance of a die casting mold can be schematically represented in a so-called “Sankey diagram”, as shown in Fig. 3. The approximate calculation of the heat volumes was based on an aluminum die-cast part (alloy AlSi9Cu3(Fe)) with a shot weight of approx. 2.2kg and a melting temperature of 670°C (corresponds to a casting temperature of approx. 620°C). In this example, heat input mainly (with a fraction of approx. 89%) occurs via the melt; in addition, approx. 10% are introduced into the mold by the heater or the heat-transfer oil (heating/cooling unit). The kinetic energy of the shot contributes to the balance with a heat input of 1%. About 20% of heat output occur in the form of radiation and approx. 20% in the form of thermal conduction and convection, especially at the fixing plates. Depending on the demolding temperature (temperature upon ejection), more or less heat is also dissipated through the die-cast part. Thus, at an assumed demolding temperature of about 270°C, approx. 25% of the total heat are dissipated via the casting. The values of the thermal balance may vary depending on the cooling and spraying concept used. For example, about 4% of the heat are dissipated with the common biscuit and plunger cooling designs. The spraying process removes approx. 6% of the heat from the die casting mold through the impinging water/spraying agent mixture. A relatively large amount of approx. 25% is transferred via the heat-transfer medium in the heating/cooling units (cooling by the heating/cooling units). 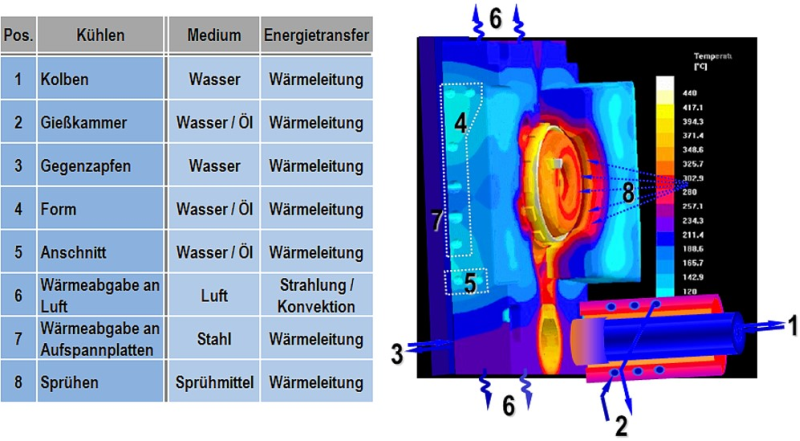 H. Rockenschaub (FT&E), Gschwandtner R. (ÖGI), Strohmaier R., Zeitelhuber E.(Robamat Automatisierungstechnik GmbH): Einfluss der Temperierkanäle auf die Vorwärmung und Temperaturregulierung einer Druckgießform, Druckguss-Praxis 3/2007, p. 97-107. Sequeira W., Kind R., Andersen S., Greenless G.: Druckguss-Praxis, no.6/2006, p. 235-242. Breitinger R.: Giesserei 70 (1983), no. 5, p. 133 et seq. Nogowizin B.: Instationäre Temperaturverteilung in den Teilen der Druckgießform, Giessereiforschung 54 (2002), no. 1, p. 29-37.